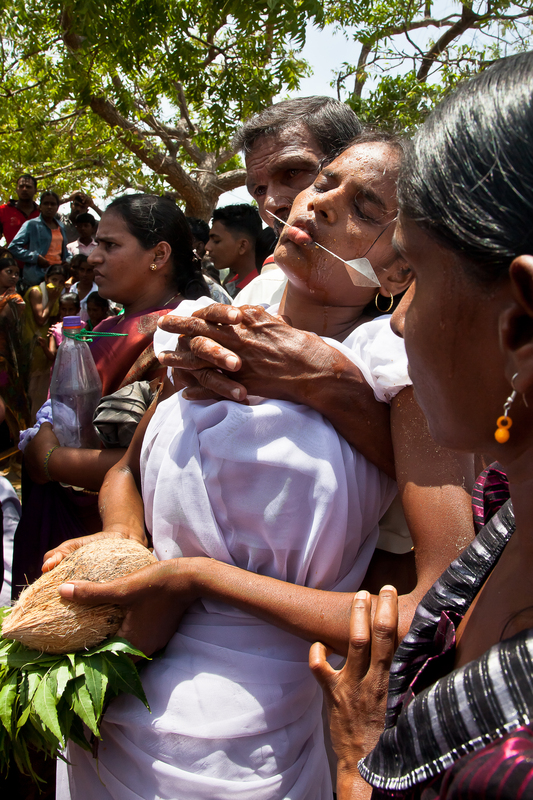 Anthropologist Malathi de Alwis and photographer Sharni Jayawardena spent more than two years traveling throughout Sri Lanka and documenting Hindu and Buddhist traditions surrounding Pattini-Kannaki. Their ensuing exhibition, 'Invoking the Goddess', opened in Colombo in February and will be traveling throughout Sri Lanka and India in the coming months. 'Invoking the Goddess' is a stunning portrait of goddess worship in a country that was ravaged by civil war for nearly three decades before fighting officially ended in 2009. Even after war's end, the country has struggled to rebuild where religious and ethnic communities have long been divided. 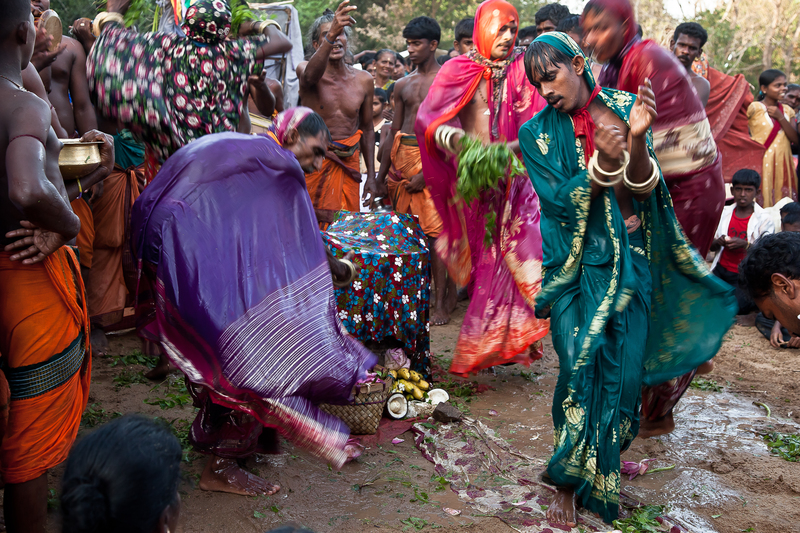 Even though the shared tradition has remained in tact amidst the violence, worshippers of Pattini-Kannaki are often unaware of the goddess' dual Hindu-Buddhist observance, as de Alwis and Jayawardena say on the exhibit's website. 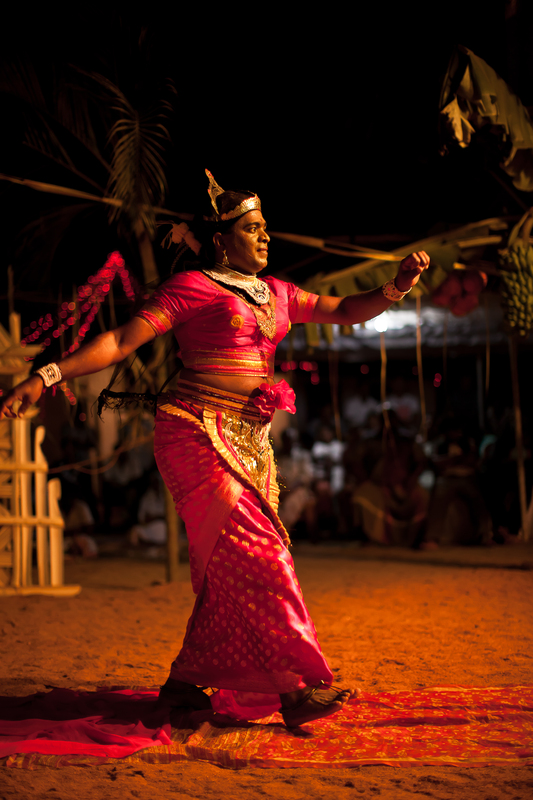 "Ironically, a significant number of Sri Lankans are unaware that she is a shared deity – an indication perhaps of the extent of the alienation between the two main ethnic communities in this small island nation...In a context where Sri Lanka is slowly emerging from three decades of civil war, and attempting to stitch together a social fabric tragically bifurcated into triumphant Sinhalese and defeated Tamils, it is timely to reflect on the shared history and traditions of Sinhalese and Tamils, Buddhists and Hindus." Part of what makes Pattini-Kannaki such a powerful divinity, de Alwis told The Huffington Post, is that she is full of contradiction. 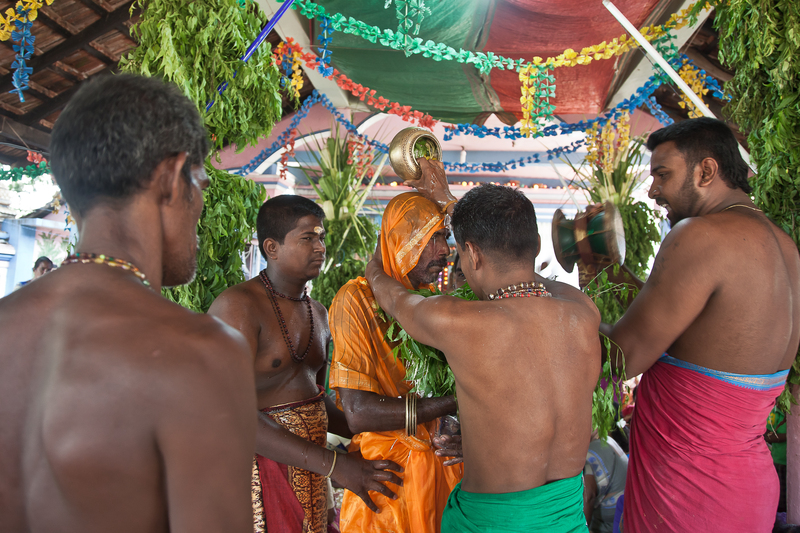 Pattini-Kannaki is initially a human, legend says, left by her husband for another woman. When he returns, the two decide to start a new life off the profit from an anklet, which the husband tries to sell at a city market. There he is wrongfully accused and executed for stealing the anklet from the Queen. The widowed Pattini-Kannaki then rises up in her anger, demanding justice from the King and ultimately destroying the city of Madurai in retribution. 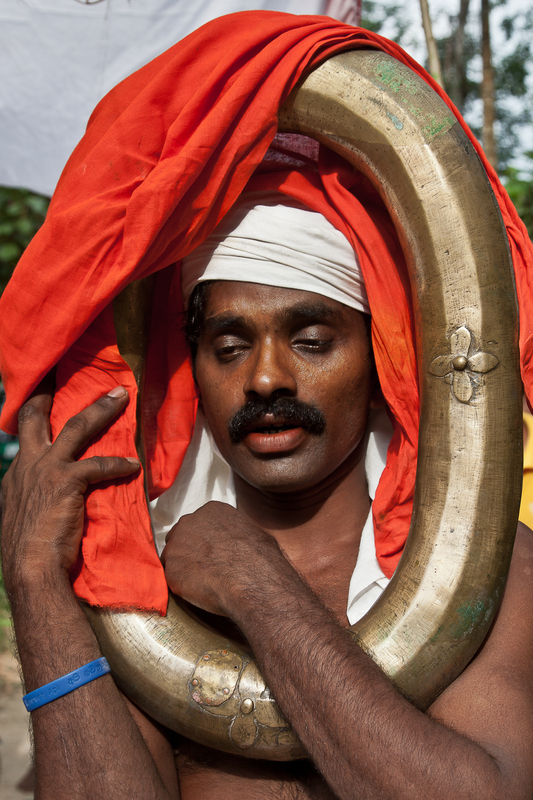 Pattini devotee, Panama, Eastern Province. 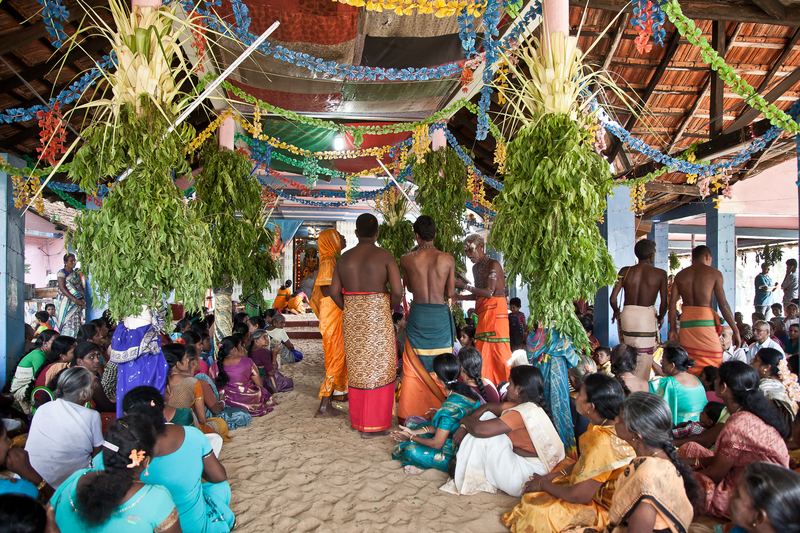 In special festivals to the goddess some devotees pierce their mouths to indicate that they are renouncing speech to focus their thoughts completely on the goddess. Some substitute their bodies with a lime or orange that is then offered to the shrine. The story takes a turn, though, when Pattini-Kannaki crosses over to the island of Lanka to "cool down." She visits various villages along her path, performing miracles as she goes. A string of temples are built in her wake. A chaste wife and a violent widow, both human and divine, Pattini-Kannaki is not the kind of goddess Sri Lankans would name their daughters after, de Alwis commented, but she is nonetheless highly revered. She is the only female deity on par with male deities in the Sri Lankan Buddhist tradition. And she is a Hindu deity despite being a widow -- a social status de Alwis says is often looked down upon in the Hindu tradition. Chief Priest incarnated by Goddess Pattini, Western Province. "In some corners of Sri Lanka, where questions of ethnicity have not cleaved them apart, Sinhalese and Tamils live together, intermarry and share in their devotion to Pattini or Kannaki, by whichever name...The government need not look very far if it wants to find a way towards post-war reconciliation; the path was laid centuries ago."